splendid 27-hole course, while also savouring the beaches and coast, and the lively nightlife of Pula, all accessible with a few minutes’ drive. The Is Molas Golf Hotel Sardegna is one of the best golf destinations in Sardinia, in a very convenient location on the southern coast of Sardinia, as it is close to beautiful beaches and only 30 km away from Cagliari, the main city in Sardinia. The area in which this hotel is located borders with Santa Margherita di Pula, in one of the most fascinating parts of the Sardinian southern coast: guests will therefore have the chance to find here, and along the coast from Santa Margherita to Capo Teulada, beautiful bays and beaches with crystal-clear water which make of this part of the island the perfect place to be for all tourists who want to enjoy the natural and untouched beauty of Sardinia. The Is Molas Golf Hotel is a good 4 star hotel, which is open all year round. The restaurant at Is Molas is remarkable for the good quality of food served as well as for the soft and romantic atmosphere when live music is played. Nice rooms, good food, beautiful swimming pool and free shuttle bus to the beach are at clients disposal in this hotel. The Is Molas Golf Hotel offers 70 rooms in total, of which 1 Junior Suite, all equipped with air conditioning, sat-TV, mini fridge, safe, balcony or terrace. 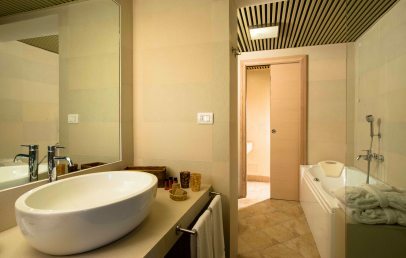 Classic – all rooms belonging to this category are on the first floor, have a small balcony and a bathroom with bath. Room size is about 28 sqm. Executive – executive rooms are on the ground floor and have direct access to the hotel garden from the small veranda. There is also an ensuite bathroom with shower. Sea View – Sea View rooms are larger than Executive rooms and have a bathroom with shower. They also have a small balcony. Suite – this is the largest and most comfortable room in the hotel, with its 60 sqm: two separated rooms are to be found here: one is the bedroom with a comfortable king-size bed, the other one is the living room. In addition to this, customers will enjoy a wonderful view from the 70 sqm panoramic terrace, from which you will see of the bay of Nora and the surrounding countryside. The bathroom is equipped with whirlpool and shower. Family Rooms – It is the best solution for families. The Family Room can have a unique room or two separated rooms. It has bathroom with shower and a minimum size of 35 sqm. Tennis court and Beauty Centre are also available. Avilable for guest a private beach area 4km away to be reached with free shuttle bus from June to September, a swimming pool with large garden, the Internet Point and a private parking. Tourist tax – The municipilty of Pula requires the payment of a tourist tax of € 2,00 per person/night to be paid on spot. 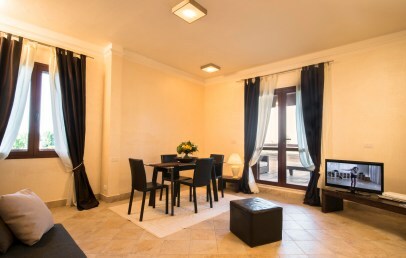 The double rooms are situated on the ground or first floor of the hotel, are spacious and bright and furnished in the typical Sardinian style, held in cream and blue colours. The private bath room has a bath tub or a shower and a hairdryer. Classic rooms further possess a balcony or a porch with garden view. 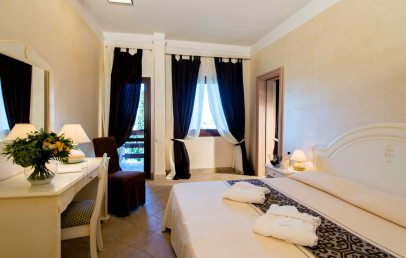 The double rooms are situated on the first floor of the hotel, are spacious and bright and furnished in the typical Sardinian style, held in cream and blue colours. The private bath room has a bath tub or a shower and a hairdryer. The pleasant balcony offers a colourful sea view. The spacious double room is ideal for families with children. It is situated on the ground floor or the first floor of the hotel and is furnished in the typical Sardinian style, thus held in cream and blue colours. The private bath room has a shower or a bath tub and a hairdryer. Family rooms have a balcony or a porch with garden view.